HT1000, JT1000,MT1500, MT2000. LTS2000,PR1500. XTS1500, XTS2250, XTS2500, XTS3000, XTS3500, XTS4250, XTS5000. New stubby UHF Antenna. Compatible with :Motorola. HT1000, HT2000. 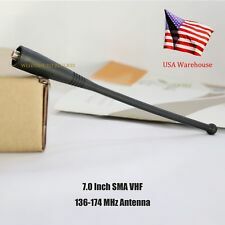 VHF 136-174 MHz 6" Antennas for use with., Astro Saber, GP1200, etc. MT2000, MTS2000, JT1000, STX. MT1500 MT2000 MTS2000. HT1000 JT1000 PR1500. ☹ Can't fit motorola analog Saber I II III ,fit digital Saber. SMA VHF Antenna. 1x SMA Antenna. XTS1500 XTS2500 XTS3000 XTS3500 XTS5000. MTX8250 MTX8250·LS MTX9000 MTX-LS. SMA type VHF long range 136-174mhz antenna. Antenna Length 6". HT1000 JT1000 PR1500. XTS1500 XTS2500 XTS3000 XTS3500 XTS5000. SMA Stubby Antenna. 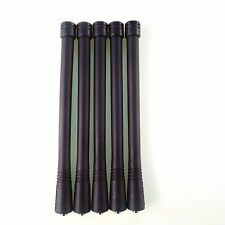 5x NAE6546Motorola Antennas. Antenna Type. (can't fit motorola analog Saber I II III ,fit digital Saber). HT1000 JT1000 PR1500. XTS1500 XTS2500 XTS3000 XTS3500 XTS5000. MT1500 MT2000 MTS2000. SMA VHF Antenna. 1x NAD6568 Antenna. ☹Can't fit motorola analog Saber I II III ,fit digital Saber. Red Code NAD6566 NAD6567. HT1000 JT1000 PR1500. MTX800 MTX838 MTX850 MTX850·LS MTX8000. XTS1500 XTS2500 XTS3000 XTS3500 XTS5000. SMA VHF Antenna. 4x NAD6568 Antenna. ☹Can't fit motorola analog Saber I II III ,fit digital Saber. HT1000 JT1000 PR1500. UHF Antenna. 400-520MHz (UHF ). Compatible with Motorola. (can't fit motorola analog Saber I II III ,fit digital Saber). MTX800 MTX838 MTX850 MTX850·LS MTX8000 MTX8250 MTX8250·LS MTX9000 MTX-LS. 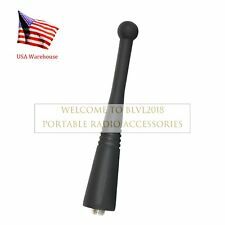 NAF5042 3.5" UHF 806-941MHz Antenna For Motorola Radio. XTS1500 XTS2250 XTS2500 XTS3500 XTS4250 XTS5000. HT1000 HT1250 HT1500 JT1000 MTS2000 MT1500 MT2000 PR1500. (can't fit analog motorola saber I II III). HT1000 JT1000 PR1500. XTS1500 XTS2500 XTS3000 XTS3500 XTS5000. MT1500 MT2000 MTS2000. 1 x Antenna. RALINK RT5390 Half-mini Wireless N Card For HP COMPAQ 630703-001 T77H355. We might require you to send us photo/s of the item received and also your original item so we can compare and conduct necessary actions. VHF Antenna For motorola Radios Walkie Talkies. Frequency:136-174 MHz(VHF ). Compatible Motorola Models Quantity: 1 pcs. NAE6546 UHF Stubby Antenna For Motorola Radio. HT1000 JT1000 PR1500 MT1500 MT2000 MTS2000. Frequency Band (MHz): UHF. Antenna Type: Helical. Compatible With Motorola Models Frequency Range (MHz): 403-435. XTS1500 XTS2250 XTS2500 XTS3000 XTS3500 XTS4250 XTS5000. HT1000 JT1000 PR1500. VHF Helical Heliflex Antenna. 151-162 MHz (VHF ). VHF Band, Helical Heliflex antennas 151-162 MHz. Wideband antennas are ideal when the radio is used in different frequencies since one antenna will cover all ranges. ☺ HT1000 JT1000 PR1500. Wideband VHF Antenna. Frequency:136-178MHz (VHF ). Compatible with : Motorola (C an't fit analog motorola Saber I II III ,fit Astro-Saber Digital radio ). Wideband antennas are ideal when radios are used in different frequencies since one antenna will cover all ranges. Ht1000 Mtx850 Mtx9250 Mts2000 Mtx950. HT1000 Adapter BNC-SMA female. Adapter HT1000 BNC-SMA. Compatible Models. XTS2500XTS3000 XTS3500 XTS5000 MTS2000 MT2000 JT1000. VHF Antenna For motorola Radios Walkie Talkies. Frequency: 136-174 MHz(VHF ). Compatible Motorola Models. XTS1500, XTS2250, XTS2500, XTS3000, XTS3500, XTS4250, XTS5000. MT1500, MT2000, MTS2000, MTX8000, MTX9000. VHF Antenna For motorola Radios Walkie Talkies. Frequency: 136-174 MHz(VHF ). Compatible Motorola Models. 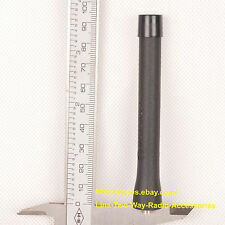 NAE6549 UHF 5.2" Antenna For Motorola Radio. HT1000 JT1000 PR1500 MT1500 MT2000 MTS2000. (can't fit motorola analog Saber I II III ,fit digital Saber). Compatible With Motorola Models. The Connector is made of plated brass material for long life. MOTOROLA HT1000 JT1000 PR1500. MOTOROLA MT1500 MT2000 MTS2000. Style: Flexible Whip. 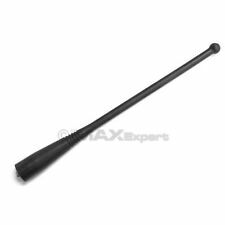 Flexible whip antennas have a one-piece finish and steel core for optimal radiation characteristics. They provide more comfort when radio is worn on the belt. Fit For GTX,MT2000,MTX2000,HT1000,LTS2000 etc. Antenna 7" 900MHz(896--941MHz) For MOTOROLA. The antenna is LIKE NEW and in GREAT working condition. I will do EVERYTHING I can to solve any issue and make you happy! I will go above and beyond to make you walk away happy. NAE6549 UHF Antenna For Motorola Radio. XTS1500 XTS2500 XTS3000 XTS3500 XTS5000. HT1000 JT1000 PR1500 MT1500 MT2000 MTS2000. PRO5750 PRO5750SZ PRO7350 PRO7350LTR. PRO5350 PRO5350LTR PRO5550 PRO5550SZ. HT1000 JT1000 PR1500. ( can't fit motorola analog Saber I II III ,fit digital Saber). "6"VHF Antenna. 136-174MHz (VHF ). Compatible with :Motorola. HT1000 JT1000 MT1500 MT2000 MTS2000 LTS2000. This antenna was engineered to maximize range. A rugged, capless design provides durability and maximum flexibility. This antenna operates in the 764-870 MHz range. Flexiblewhip Antenna #8505241U04. HT1000 JT1000 PR1500. MT1500 MT2000 MTS2000. 900mhz Genuine Original OEM Motorola Antennas. 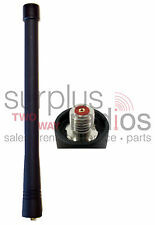 900MHz Band, Flexible whip antennas 896-941 MHz - "Blue" Color Code 170mm Length. HT1000 JT1000 PR1500. XTS1500 XTS2500 XTS3000. STUBBY UHF HELIFLEX ANTENNA. This antenna operates in the 400-520 MHz range central frenquncy is 460 MHz. 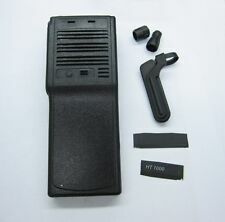 Compatible with MOTOROLA radios NAE6546/7/8 THREE IN ONE. XTS1500 XTS2500 XTS3000 XTS3500 XTS5000. HT1000 JT1000 PR1500. Compatible with motorola models. (can't fit motorola analog Saber I II III ,fit digital Saber). MTX800 MTX838 MTX8000 MTX9000 MTX-LS. HT1000 JT1000 PR1500. Compatible Motorola Models Length: approx. HT1000 JT1000 PR1500. ( can't fit motorola analog Saber I II III ,fit digital Saber). 6" VHF Antenna. 136-174MHz (VHF ). Compatible with :Motorola. MTX800 MTX838 MTX850 MTX850·LS MTX8000 MTX8250 MTX8250·LS MTX9000 MTX-LS. XTS5000 XTS3000 XTS2500 XTS1500 HT1000 MT2000 MTS2000 JT1000 PR1500 MT1500. XTS1500 XTS2500 XTS3000 XTS3500 XTS5000. MT1500 MT2000 MTS2000. HT1000 JT1000 PR1500. Antenna Type. SMA Stubby Antenna. (can't fit motorola analog Saber I II III ,fit digital Saber). MTX8000 MTX8250 MTX8250·LS MTX9000 MTX-LS. Astro XTS1500, XTS5000, XTS3500, XTS2500, XTS3000. MTX9250, MTX950, MTX9000 etc. HT1000, HT2000, JT1000 etc. 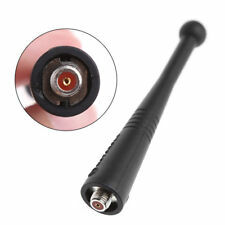 800MHz Stubby Antenna for Motorola radios. 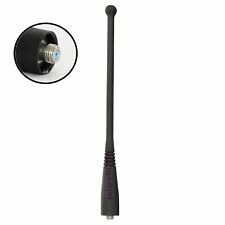 This stubby antenna is ideal when the radio is worn on the belt since the short antenna is non-obtrusive. MOTOROLA HT1000. UP FOR SALE IS ONE OEM ORIGINAL MOTOROLA VHF WIDEBAND ANENNA 136-174MHZ. THESE ANTENNAS ARE THE BEST VHF ANTENNAS FOR OPTIMUM SIGNAL PULL AND SIGNAL THROW. THEY OUT-PERFORM ANY OTHERS I'VE USED AND I'VE USED THEM ALL! XTS1500 XTS2500 XTS3000 XTS3500 XTS5000. HT1000 JT1000 PR1500. (can't fit motorola analog Saber I II III ,fit digital Saber). Compatible with :Motorola. HT1000 JT1000 PR1500. MT1500 MT2000 MTS2000. Wideband VHF Antenna. 136-178MHz (VHF ). VHF Band, Helical 136-178 MHz - "white" Color Code. ". one antenna will cover all ranges. Heliflex Antenna. Compatible with :Motorola. XTS1500 XTS2250 XTS2500 XTS3000 XTS3500 XTS4250 XTS5000. HT1000 JT1000 PR1500. UHF Flexible whip Antenna. UHF Band, Flexible whip antennas 403-520 MHz - "Light grey" Color Code 133mm Length. 400-520 MHz (UHF ). XTS5000 XTS3000 XTS2500 XTS1500 HT1000 MT2000 MTS2000 JT1000 PR1500 MT1500. 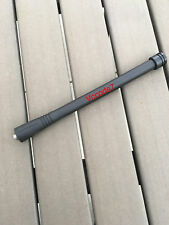 New Motorola OEM stubby SMA UHF 470-520mhz antenna for Motorola radios with SMA antenna jacks. HT1000 JT1000 PR1500. "7"VHF Antenna. 136-174 MHz(VHF ). Compatible with :Motorola. MT1500 MT2000 MTS2000. Trending at $7.15eBay determines this price through a machine learned model of the product's sale prices within the last 90 days. Compatible with Motorola HT 1000. front outer case. Trending at $15.98eBay determines this price through a machine learned model of the product's sale prices within the last 90 days. HT1000 JT1000 PR1500. (can't fit motorola analog Saber I II III ,fit digital Saber). UHF Antenna. 400-520MHz (UHF ). Compatible with :Motorola. 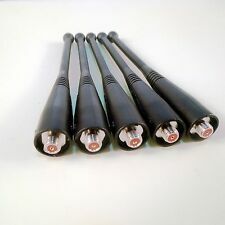 2 UHF Antenna MOTOROLA HT1000 XTS2500 XTS3000 XTS3500 Visar MT2000 MTS2000 7"
HT1000 JT1000 PR1500. UHF Flexible whip Antenna. UHF Band, Flexible whip antennas 403-520 MHz - "Light grey" Color Code 133mm Length. 403-520 MHz (UHF ). Flexible whip antennas have a one-piece finish and steel core for optimal radiation characteristics.